Two days after Chancellor Lloyd George spoke in London to rally the nation, First Lord of the Admiralty Winston Churchill gives a speech of his own today in Liverpool. Afflicted with a lisp, he is not a gifted speaker like George, but the depth of his feeling is clear to all. Churchill loves war; he loves everything about it, and wants nothing more than to lead men in it. The war has begun to bog down in trenches, as every nation planned for rapid victory but all their plans have failed. His speech hints at the scale of the sacrifice that the United Kingdom will be asked to make in the now-protracted conflict when he calls for one million volunteers to serve in uniform, which is a number two and a half times the size of the nation’s total prewar army. 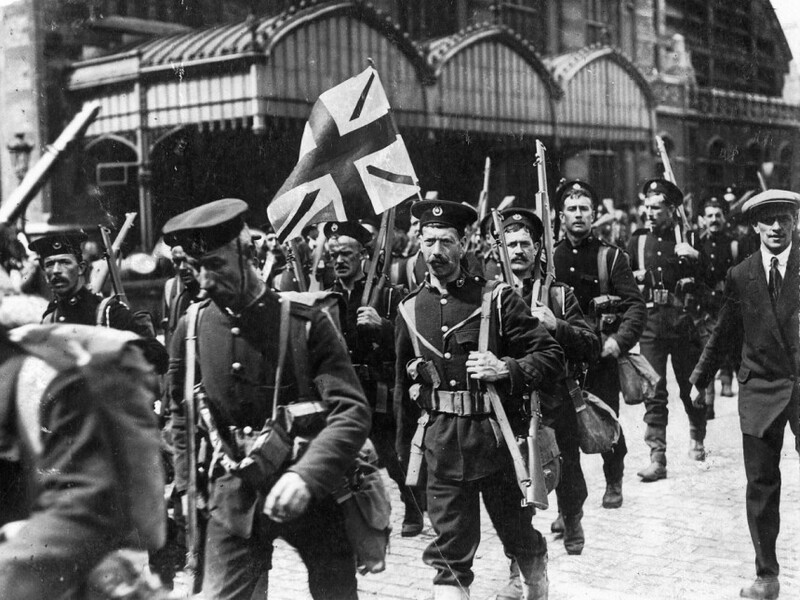 By 1918, Britain will have more than four million men and women serving in uniform — and a million British subjects will be dead. Churchill feels driven to personally oversee as much of that slaughter as possible. What Churchill doesn’t say actually tells us something, too. He makes no mention of the HMS Pegasus, an old cruiser that was surprised and destroyed yesterday at Zanzibar by a more-modern German cruiser. 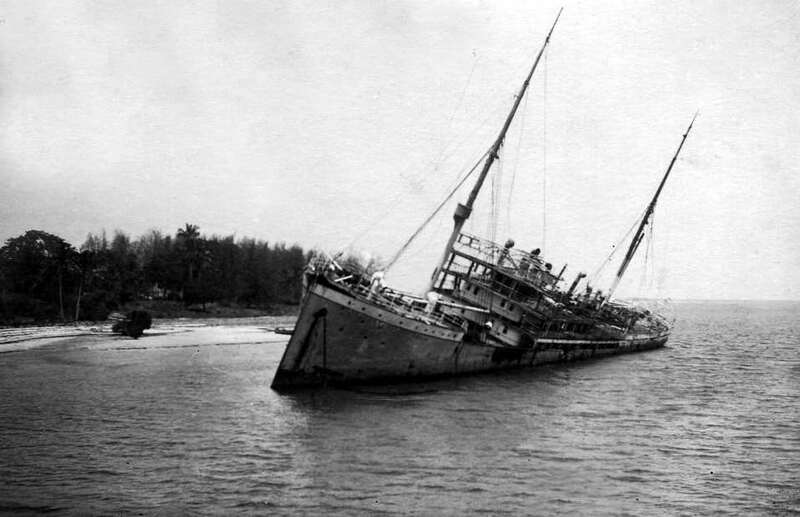 He says nothing of the Emden, another German cruiser that is making headlines by capturing British merchantmen in the Indian Ocean right now. Nor does he mention Admiral Graf von Spee’s East Asian Squadron, a formation his intelligence networks have been unable to locate but which has already cut a British sea cable at Fanning Island. He dares the Kaiser to sail his High Seas Fleet out of port and bring the war to a quick decision in the North Sea, saying that it will “be dug out” if he doesn’t. This is an oblique reference to the recent Battle of Heligoland Bight, a successful operation to ambush and destroy German light cruisers while their battlewagon brothers were in harbor. The battle was indeed a victory, but Churchill’s timing couldn’t be worse. Tomorrow morning, the German submarine U-9 sinks three aging cruisers off the coast of Belgium, one after another, like sitting ducks. Believing the Aboukir has hit a mine, the Hogue and the Cressy are each attacked and sunk while rescuing survivors. More than 1,400 British sailors die because no one really takes the submarine threat seriously yet. The very next evening, the Emden makes a daring raid on Madras, destroying onshore oil tanks with shellfire. No one has done more to prepare the British Navy for the new war. 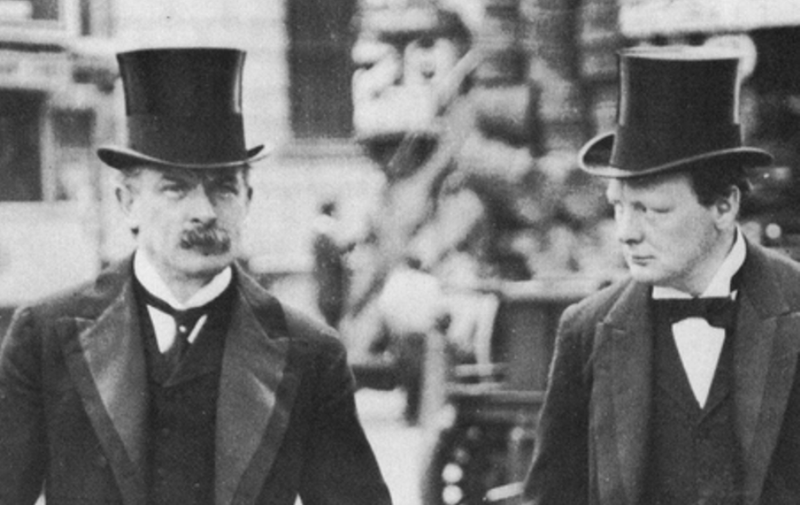 Upon taking the office in 1911, one of Churchill’s first bureaucratic fights was to start converting the fleet from coal to oil, a move that has resulted in the creation of the Anglo-Persian Oil Company. He also pushed for the navy to adopt airplanes, and its first aircraft carrier is being built even now. Yet by November, Churchill’s fleet movements will be under fire — and his need for personal glory will become a great frustration for Lloyd George and the Asquith government. Churchill also says nothing of Belgium, the neutral country just across the English Channel whose defense is Lloyd George’s chief justification for Britain’s involvement in the war. 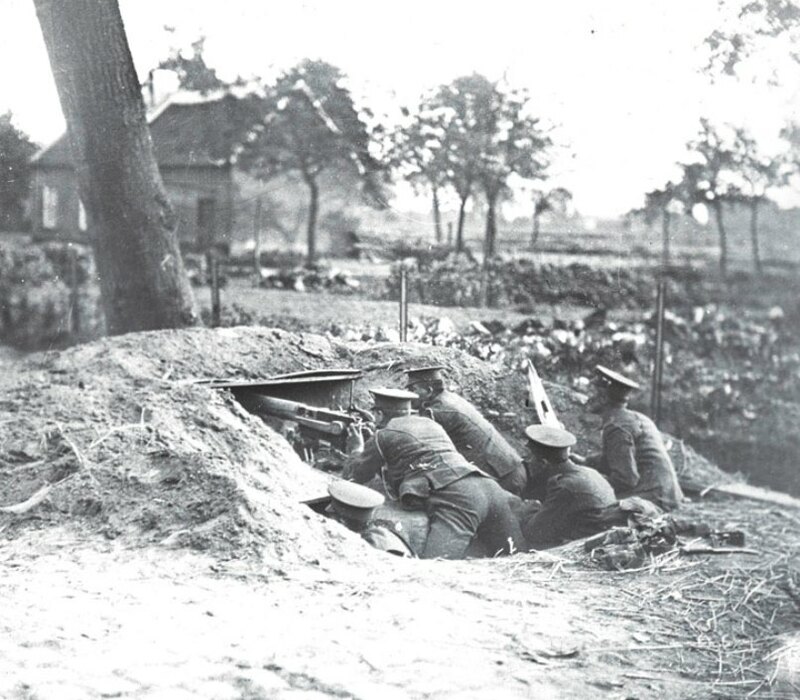 The Belgian government has already sent out two sorties that failed to break the German reservists holding a line south of the port city of Antwerp; they will send a third sortie in another five days, but it is swiftly repulsed. Thus far, the Kaiser’s generals have chosen to bypass Antwerp to attack France. With their offensive halted and the Western Front taking shape, however, the threat to German communications is sure to provoke a response. And though the allies do not know it, the Kaiser’s government has in fact decided to make the city part of his empire. The fall of Antwerp seems inevitable to French Commander in Chief Joseph Joffre, but the government in London is still interested in defending what remains of ‘brave little Belgium.’ This may explain the absence of the topic from Churchill’s speech today, for the issue is being argued in cabinet: his friend Sir John French is lobbying the Asquith government to withdraw the British Expeditionary Force from France and send it to Antwerp. Saner heads prevail, but Churchill’s hastily-organized Antwerp expedition is a farcical attempt to engineer a replacement. 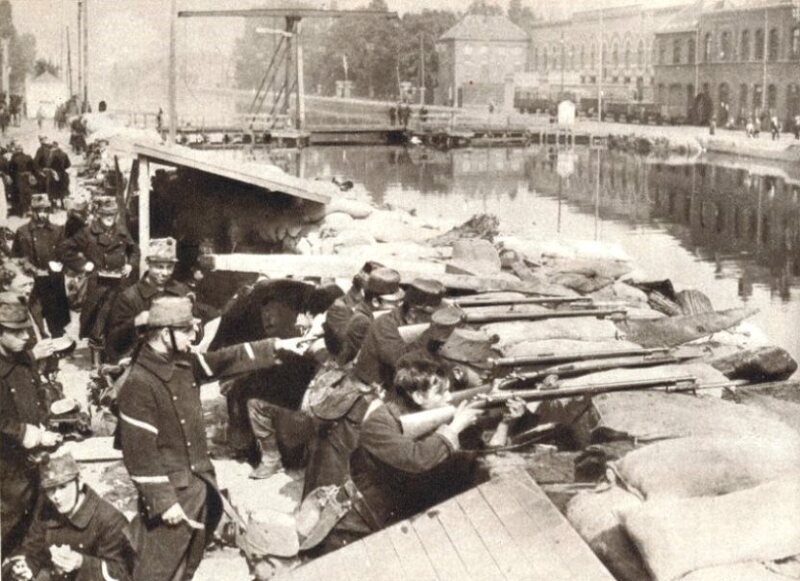 His plan begins with 2,500 Royal Marines arriving at the port of Ostend wearing their dark blue shipboard uniforms. The corps has been neglected for years; most of them have little to no training, while many of them are reservists in their fifties and sixties. Khaki uniforms do arrive, along with some machine guns and shovels for digging trenches. 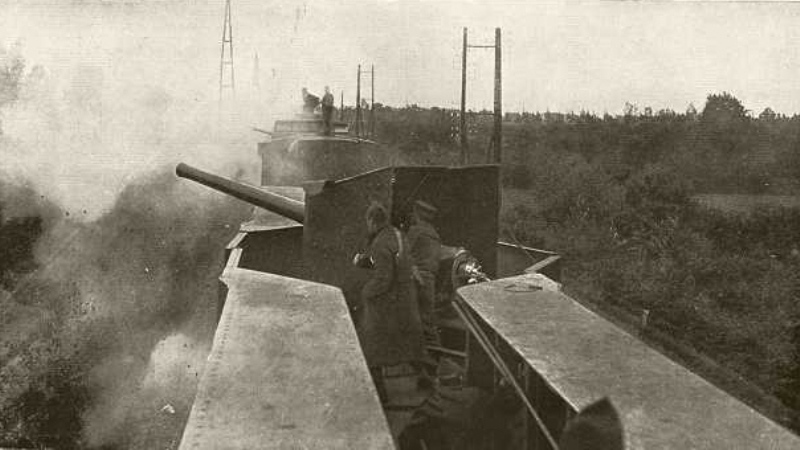 Arriving on the 5th of October, Churchill personally inspects the defenses in an open-topped Rolls Royce; he secures armored cars and an armored train for the expedition, but not any artillery. Meanwhile, the Germans are firing the most powerful guns on the planet using spotters in tethered balloons to correct their fire. This swiftly reduces the powerful Belgian forts to rubble and leaves the city impossible to defend. Despite his previous order to hold the line “til the last man,” Churchill withdraws his scratch force and comes home to find that the letter he sent Prime Minister Henry Asquith before leaving — a letter requesting to be given a field command — has become a joke within the cabinet. 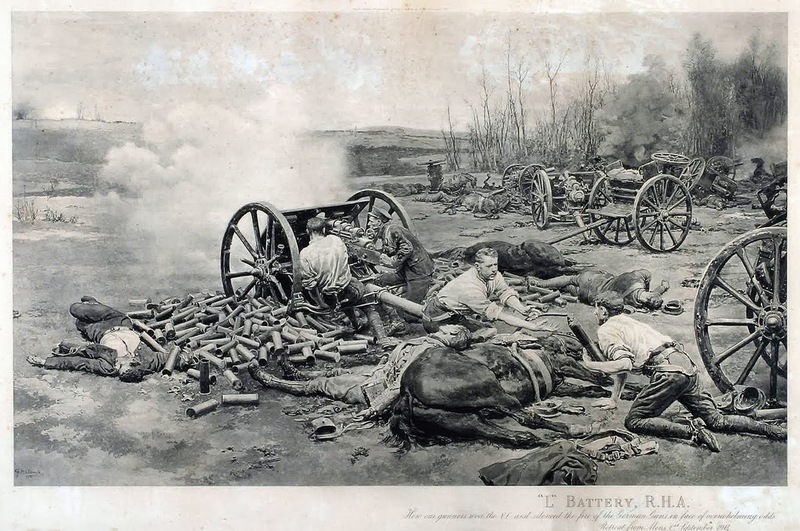 “W is an ex-lieutenant of Hussars,” Asquith writes, “and would if his proposal had been accepted have been in command of 2 distinguished major generals, not to mention Brigadiers, Colonels, &c.” The ignominious folly at Antwerp has greatly harmed his warrior-reputation. The enemy, Churchill says, is Prussian militarism, not the German people; yet his ships (he does think of them as his ships) are already blockading German trade — with enormous consequences for German civilians. “We mean to win it,” Churchill says of the war as he ends his speech. Yet the very spending limits that he has helped George and Asquith maintain on Britain’s land army in the prewar years are showing up now in defeats and casualty lists. The Royal Marines are unready for any war, much less this one. The navy is the only military department on which Britain has lavished public funds, but Churchill has still sent obsolete cruisers rushing after modern German ones. 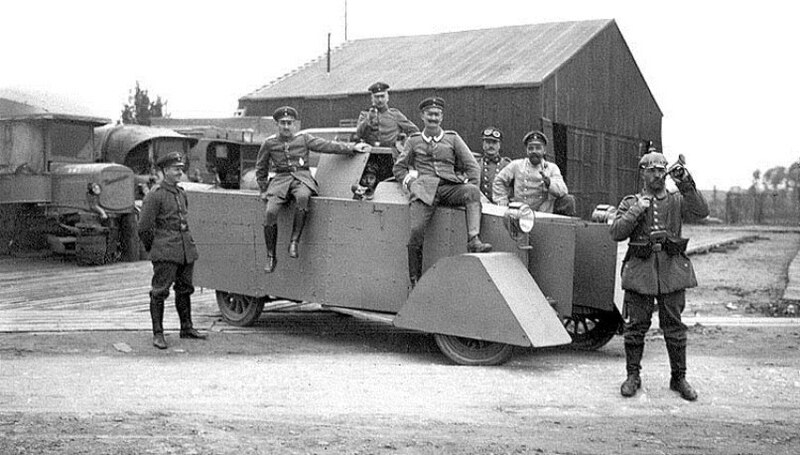 One of the most important men of the 20th Century is not having a very good war, but his experience with armored cars and trains has given him some new ideas. They take form in February as the ‘Landships Committee,’ a secret initiative to build armored cars that can fight through wire and mud. Winston Churchill certainly had some great ideas, but not all of them were good; many were terrible, and most of them were grandiose.